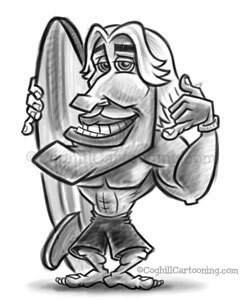 Surfer Dude cartoon character mascot art drawing. One thing that will definitely change will be the “hang loose” hand gesture, it looks too much like “call me”. This was one of those drawings where the artwork just seemed to flow out of the pencil. The hands came out especially nice without much reworking (if any, I can’t recall now). Im relly intrested in all of these desighns im a senior in highschool and im looking into a career that uses this type of skills i love to draw and i love to come up with ideas like logos and also other things for companys well i would like to do that and i was wondering where i should go to have a steady career and what then would be the right place to go into when i go to college if you know what i mean. Look into graphic design courses at colleges/universities/art schools (sometimes referred to as ‘visual communication’). If you want to look into illustration, then look for schools that offer illustration courses/degrees like the Art Institutes.